Folk, common, local, whatever, history is a fascinating thing (no surprise then, that I grew up listening to This American Life). I’m convinced that there is no place you can find that is not interesting, especially if you happen to live in a large city. I live in the Hayes Valley neighborhood of San Francisco. While it does seem neat, clean, and nice, if you pull things back and look beyond the gentrification, the boutiques, the parks, the disappeared freeway, and the earthquake – back into the 80’s – you would find the identity and experience of this neighborhood completely different. Back then the neighborhood (but, honestly, most parts of most cities) was pretty “edgy”. Indeed, in 1979, Chris Pirsig (from ZAMM) was murdered a few blocks away from my apartment. However, despite all of the drama of the moment, in history, most events are forgotten and stories remain untold. I’d reserve judgment on whether or not this is a good thing, but, good or bad, this does make the discovery of those stories, regardless of provenance, something precious. While it’s best to avoid, sometimes it you must duplicate the appearance of UIToolbar items. Unfortunately, UIKit doesn’t appear to provide any means for achieving the etched look that it adds on each item it has control over so, for custom UIBarButtonItems you must do it manually. In my case, I needed to present some information on the toolbar, but needed it to be non-interactive, have a special layout, and use some existing vector images. To that end, here are some category methods that made it straight forward: https://gist.github.com/2465637. Given that, etching can be had with a few lines. It’s not efficient, but it is easy. Late last week a little app of mine made its way onto the App Store. So congratulations to me! 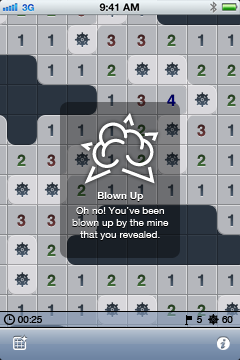 but, uh, a minesweeper clone? that would not be very original. Nope, it’s not very original, but it is better†. It is my weak protest against the garish implementations that litter the App Store. It’s not something I’d plan to profit from (game development has always seemed to be an inevitably feral existence), but an argument for quality in the App Store, where barring a few exceptions it can seem like there is so little. …It was also fun to do. † How many times have I heard that said before? Ugh, I’m pretty tired of the endless parade of “Oh hai, iz wrtn a JS loaderz” projects. Given the number of existing implementations and the general solved-ness of the problem, the time devoted to it is disappointing. But here I am, doing just the same. Simplicity is best. Only implement the necessary features. Caching should be exploited. Expensive one-time operations are acceptable provided their responses are reusable. Modules are well defined, widely used, and well founded. The five different asynchronous loading specifications, not so much. This leads to what I’m given to think is a much simpler version that works than existing implementations. The other nice thing is that the packaging tool takes an original approach to solving the dependency issue. Naïve implementations are good. Those implementations may be slow, but they are also cheap and set the stage for proper optimization. Chances are, that many possible optimizations are rendered unnecessary by the right tools. Most current implementations use one of five ways to wrap a module’s code with a description of the dependencies that that code requires, and which a library will fetch asynchronously, finally evaluating the modules code once all are loaded. The thought being that, once that module is received, first all of its dependencies need loading (asynchronously so they are non-blocking, natch). IMHO, that obscures the more obvious and important observation, that having dependencies that aren’t loaded by the time the current module is loaded, asynchronous or not, is never good. If this is to be treated as an optimization problem, then the issue is one of packaging. If the packaging works well, the question of synchronous/asynchronous loading is moot. Existing packagers all perform some sort of parsing on source files, usually a regular expression, maybe a full preprocessor language. Both approaches have the downsides of requiring boilerplate code or being unreliable. There is also the additional complication of describing lazy dependencies so that they do not get confused with loading dependencies. The good news is that, given the availability of non-browser interpreters, there is a third way, where the code itself can be evaluated offline and dependencies extracted during run-time. Not only would this extract only those dependencies needed exactly at load time and require no boilerplate, using the same kernel in both environments, it would keep both the client and the packager’s results consistent. It’s a common observation that different areas of a project change at different rates. This is certainly the case in web applications where library code will change much slower than application code. It follows then that updates to application code should have no effect on still cacheable library code. Convention already specifies this using a leading slash for '/application/code' and none for 'library/code'. This is simple to exploit by allowing different URIs for the two classes of code. The tool that implements this loader provides two things things, a kernel and a module compiler. For the moment it is on an experimental branch of the Modulizer project, though I’m beginning to like “Yajsml” more and more. This the first iteration in a longer project with several more big ideas to adopt, but, IMHO, aside from one or two missing features, this is a pretty comprehensive solution for the problem of distributing code from the client’s perspective. The remaining improvements revolve around improving the optimization of packaging and using the cache more effectively. Regarding effective use of the cache, having module requests get redirected to designated/canonical packages has lots of potential to increase cache hits when loading order varies – such as across pages. As far as finding an optimal packaging goes, it’s the kind of problem that sounds like the perfect job for some sort of nondeterministic heuristic-ish algorithm. And finally, while the two buckets, libraryURI and rootURI, are probably sufficient for most projects, the thought of allowing for multiple library paths is appealing. Searching would of course be made more expensive for some modules, but I suspect that ordering the search paths by increasing frequency of updates may allow caching to compensate for this. require-kernel: A minimalist implementation of require that supports asynchronous retrieval. yajsml: An asset server that performs packaging and clever things like redirecting to a canonical resource. modulizer: A tool that finds dependencies at runtime. Below is a snippet that will return the global object independent of scope and interpreter. Note: except in the rarest of cases, direct address of the global object is illegitimate regardless of approach, using this more robust snippet is no excuse.